With only one day until the Super Bowl, it would make sense for Bears fans to be talking about this year’s matchup between the Patriots and Falcons. Whether it was about Tom Brady solidifying himself as the greatest ever to play the game with another Super Bowl victory or if MVP candidate Matt Ryan can find a way to lead his No. 1 scoring offense to a franchise’s first Super Bowl victory. That isn’t the case. 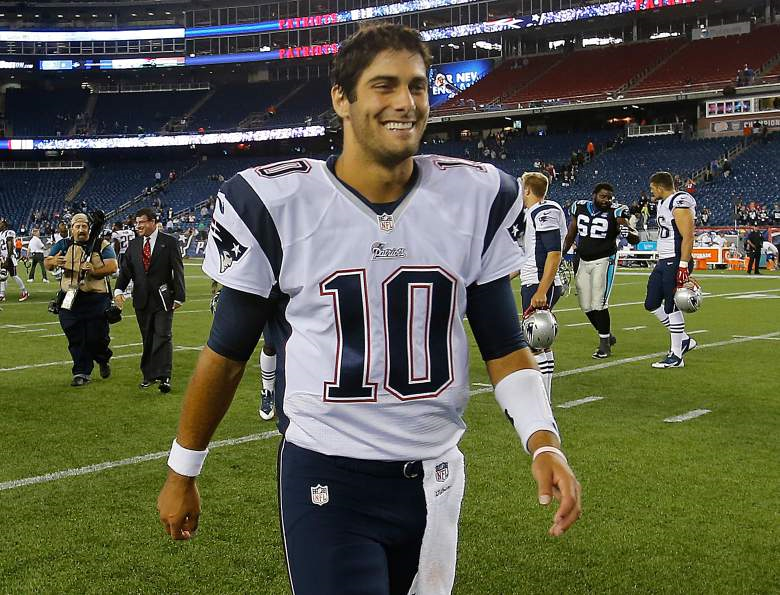 Instead the Chicago media and Bears fans are talking about another quarterback – Patriot’s backup Jimmy Garoppolo. According to sources around the league, the Bears will push hard to pursue the former Eastern Illinois star. It makes complete sense for the Bears to pursue a new face of the franchise. Last season, the Bears played four different quarterbacks and amongst them, Jay Cutler is almost certain not to return next season. The historic franchise is in desperate need for a quarterback. Ryan Pace has been the Bears general manager for two seasons, and already he has negotiated three trades with the Patriots. The first was when the Patriots acquired guard Ryan Groy for 2015 sixth-round pick, linebacker Matthew Wells. Then the Bears traded Jonathan Bostic for a sixth-round pick, and the most recent being when the Bears traded Martellus Bennett for a fourth-round pick and a sixth-round selection. The two organizations have some familiarity with each other and now one of the Bears main priorities this offseason will be to try and acquire Garoppolo. ESPN’s Adam Schefter reported that the Patriots will be asking for a first and fourth round draft pick. It’s the same exact price that it took for NFC North division rival, Minnesota to acquire quarterback Sam Bradford. Now, a first and fourth round pick are not set in stone. I’ve heard that the Patriots are willing to trade for this year’s second round pick and next year’s. Nobody for sure knows the asking price, but the Bears are willing to negotiate. And negotiating with the Patriots seems to be something the Bears should look to implement every season. Last year, the Bears gained arguably their best defensive player, defensive end Akiem Hicks, who last played for the Patriots. What makes players from the Patriots so valuable is that they come from an organization that consistently competes for Super Bowls. For three years, Garoppolo has sat behind one of the greatest quarterbacks ever to play the game. There is no doubt he has learned some tips from the four-time Super Bowl champion. Some say it’s the Patriots’ system that makes players look great and people will bring up guys like Brian Hoyer, Matt Cassel and Ryan Mallett as quarterbacks who didn’t live up to expectations outside of New England. That may be true, but is it a better option to use a first-round pick on a quarterback that would most likely not even see the playing field in his first year? Keep in mind, if the Bears did draft a quarterback in the first round, there’s no guarantee he’d become one of the league’s best quarterbacks. Drafting another potential project is the last thing Bears fans want to see. Look at wide receiver Kevin White, for example, he wasn’t a polished route runner coming out of West Virginia, and it has shown in his limited time that he has seen the field in his first two years. Draft prospect Mitch Trubisky out of North Carolina has only had one full season as being the full-time starter. Clemson’s Deshaun Watson has proved that he can perform in the biggest of moments – both National Championship Games against Alabama, but his 17 interceptions this past season and playing style might leave NFL teams wondering if he is capable of being a franchise quarterback. The Arlington Heights native would be a day one starter and would give John Fox the best opportunity to remain head coach of the Bears. Say Brian Hoyer is the starter next season, he gets injured four games into the 2017 season and then all the pressure is thrown on an inexperienced rookie quarterback. Who knows how the season would play out, but if Fox ends up with another losing record it is almost certain he would be kicked out of Chicago. The Bears can’t keep switching head coaches, that’s not how winning organizations are made. There needs to be some consistency, Patriots head coach Bill Belichick and Brady have been together for an astonishing 16 seasons. Personally, I would take the risk with a guy who has three years of NFL experience over any of the quarterbacks that are coming out in the draft. In my one-on-one interview with Bears ESPN staff writer Jeff Dickerson, he said he likes the idea of the Bears making a move to get Garoppolo. If the Bears were to acquire the three-year backup, they would have to sign him for a big contract. If they choose to let him play out his last season, he will become a free agent the following year and if Garoppolo had a decent first season, that would send quarterback-needy teams into a frenzy to try and sign him. From what I’ve seen, a contract along the terms of Houston quarterback Brock Osweiler would be the asking price, which was a four-year 72-million-dollar contract. Yes, that does seem a bit extreme for a guy who has only played six quarters of football. But, in that short amount of time he has a completion percentage of 71 percent on 42 of 59 passing attempts, thrown four touchdowns, no interceptions and passed for 496 yards. He may be unproven, but he can play. Look at some of these plays that showcase some of Garoppolo’s skillset. If you were watching an NFL game for the first time, you wouldn’t think that Garoppolo was making his first career start against the Cardinals. On 3rd & 15, he starts off looking right and does a pump fake, but doesn’t force the ball. Then moves left, keeping his eyes downfield and places the ball perfectly between three defenders. Here in his second career start against the Dolphins, Garoppolo shows great poise in the pocket, steps up, doesn’t panic and delivers an accurate ball, despite having a defender in his face. On this play, Garoppolo starts off by scanning the field looking left and doesn’t find an open receiver. He then looks right, stands tall in the pocket, and throws a touchdown to Bennett, between the linebacker and safety. Garoppolo isn’t perfect, but he is the best option for a fresh start at quarterback. It’s time to bring Garoppolo back home. Cutler is killing this team, he has what only one year without an injury, they need a new talented QB I for one am tired of losing.